How does Fact Plus work? Do I have to use first morning urine? I am not sure when my next period is due. How do I know I am testing at the right time? How soon can I read the result? I have used the pregnancy test but no blue line has appeared in the Control Window. What should I do? What might affect the accuracy of the result? My test says I'm pregnant, what should I do? My test says I'm not pregnant, but I think I am. What should I do? Q. How does Fact Plus work? A. 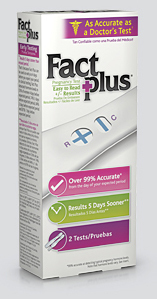 Fact Plus detects hCG (human Chorionic Gonadotropin), a hormone present in urine once you become pregnant. A "+" result indicates that hCG has been detected. The amount of hCG in your body increases in the early stages of pregnancy. Q. When can I test? A. Fact Plus Pregnancy Test Stick can be used as early as 4 days before your expected period. If you test before your expected period and get a "-" (not pregnant) result, there is still a chance that you may be pregnant. In clinical testing, Fact Plus found that pregnant women testing 4 days before their period had a 53% chance of getting a positive result. At 3 days, the chances increased to 74%. And when testing 2 days or just 1 day before, chances increased to 84% and 87%, respectively. Q. Do I have to use first morning urine? A. Your first morning urine usually contains a higher concentration of hCG. If testing early (before your expected period) it is recommended you use your first morning urine. Otherwise, you can test at any time of the day. Please note, drinking large amounts of fluids before testing may dilute the hCG in your urine and cause an inaccurate result. Q. I am not sure when my next period is due. How do I know I am testing at the right time? A. You need to work out when your period is due. Calculate your usual cycle length by counting the number of days from the first day of your period until the day before your next period starts. With irregular periods you should test according to your longest cycle in recent months. If you are uncertain when your period is due, we recommend testing at least 19 days from the day you think you became pregnant. If the result is negative you should test again in 3 days because you may have tested too early. Q. How soon can I read the result? A. You can read your result after 2 minutes as long as a blue line has appeared in the Control window. A "+" (positive) result may appear as early as 1 minute. Disregard all results after 10 minutes. Q. Are there any factors that can affect the test result? Always read the manufacturer's instructions for any medication you are taking before taking the test. Fertility drugs containing hCG (such as Pregnyl®, and Profasi®)**, can affect the result. Testing with Fact Plus too soon after administration may give a false "+" result. Other fertility therapies (such as Clomid®)***, painkillers and the contraceptive pill should not affect the result. If you have recently stopped taking the contraceptive pill or are using fertility therapies like Clomid®, your periods may be irregular, leading you to test too soon. If you have recently been pregnant (even if not carried to full term) you may get a false "+" (positive) result. In addition, ovarian cysts, ectopic pregnancy, menopause and some very rare medical conditions can give misleading results. Q. I have used the pregnancy test but no blue line has appeared in the Control Window. What should I do? The absorbent tip was not kept pointing downwards or the Test Stick was not laid flat after urine was applied. Too much or too little urine was used. Your must sample for 5 seconds. You should test again, using a new test, taking care to follow the instructions. You may wish to only collect a sample of your urine in a clean, dry container and immerse only the absorbent tip for 20 seconds only. Q. What might affect the accuracy of the result? If you repeatedly get unexpected results, you should check with your health care professional. Q. My test says I'm pregnant, what should I do? A. You should see your health care professional who can advise you on what steps you should take next. Q. My test says I'm not pregnant, but I think I am. What should I do? A. A "-" (negative) result means no hCG has been detected. Wait 3 days and test again using a new Fact Plus pregnancy test. If you still get a "-" result and your period has not started, you should see your health care professional. *Pregnyl® is a registered trademark of Organon USA, Inc. Profasi® is a registered trademark of Ares Trading S.A.
**Clomid® is a registered trademark of Aventis, Inc.
- Fact Plus is a registered trademark of SPD Swiss Precision Diagnostics GmbH.